Understanding the movements of the stars has been on mankinds mind probably since we first stared into the sky. Through the ages we can predict where a star or planet will be in the sky in the next few months, years, even hundreds of years, but to be able to predict the exact orbital details for ALL time is rather more tricky. This helps understand how planetary systems form, and the conditions that make that possible. It allows us to see what happens when two massive black holes pass each other by, will the merge? will they orbit? will one go rogue? These are interactions that take millions of years, and thus we need to calculate the gravitational forces very accurately. This isnt a terribly hard problem for two bodies, and is doable for three with little fuss, but for numbers of bodies greater then that, the calculations grow rapidly, on the order of N2/2. In the late 1980’s Tokyo University began work on developing a computer to calculate these forces. Every gravitational force had to be be calculated with its effects on every other body in the system. These results were then fed to a commodity computer for summation and final results. 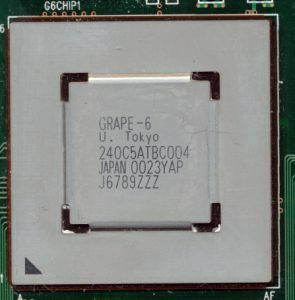 This made the Tokyo project a sort of Gravity co-processor, or as they called it a Gravity Pipeline, GRAPE for short. 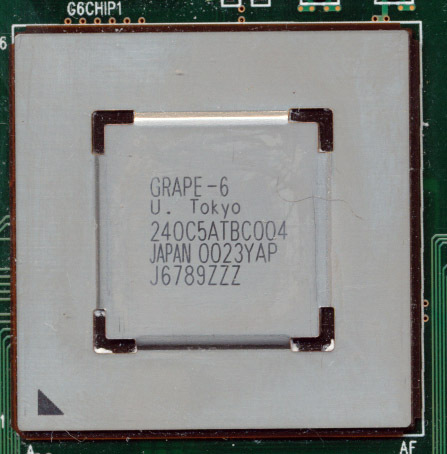 The GRAPE would do the main calculations and feed its results to another computer.